iOS 9 untethered jailbreak tool has updated by Pangu into the Pangu v1.2.0 and it is compatible for all iPhone, iPad and iPod touch such as iPhone 6s, 6s plus, 5, 5s, 5c,4s, 6, 6 plus, iPad 4, 3, 2, iPad mini, retina iPad mini, mini 3, Air, Air 2, iPod touch 5G and 6G running on iOS 9, iOS 9.0.2 and iOS 9.0.2. However, Mac users should be waiting for their tool, because the new tool is also currently available only for windows users. But if you are running a Mac, you can jailbreak iOS 9 using windows installed virtual PC on Mac. Pangu 9 1.2 has out with latest cydia installer v1.1.26 and Manage Storage bug fix. Fixed the Manage Storage bug. Preferences > Storage&iCloud > Manage Storage. Introduced latest cydia version of v1.1.26 with new patcyh which fixed failure to open MobileSafari URL scheme. Just download Pangu9 1.2 new tool from our direct download given below and go through our guidelines to give proper jailbreak for your iPhone, iPad or iPod touch. Keep in mind that if you have already jailbroken your idevice using any Pangu 9 jailbreak tool, no need to jailbreak your device again. You can restore the latest pangu untethered package simply open the cydia. Disable Find my iPhone option from Settings > iCloud > Find my iPhone > Turn off. Enable Airplane mode in your iDevice. Disable Passcode or Touch ID from Settings > General > Passcode or Touch ID > Turn off. Take complete device backup using iTunes or iCloud. The backup will be a good idea when you something goes wrong. If you already updated firmware using OTA, you should restore your device again using iTunes, because OTA updates do not capable for jailbreak method. 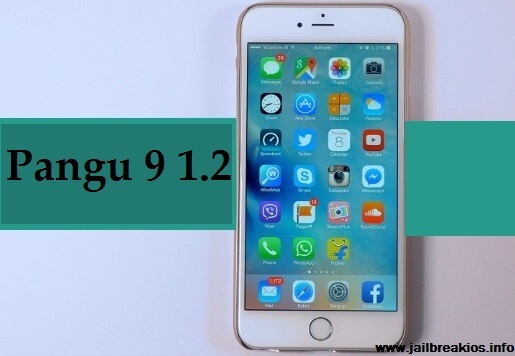 Download Pangu 9 1.2 from our direct download link. Attach your iPhone to your PC using USB cable. Open the tool and allows to identify your idevice. In order to click Start and Already backup buttons to continue the process. Then Pangu will unlock your device and enable airplane mode again. Now Pangu will run on the home screen. After few times, you will see the jailbreak completed message. And then the device will reboot automatically. Now you can open the cydia and download your favorites. The process is done. Now you can enable device’s Find my iPhone, Passcode or touch ID options and anti-virus programs. If there have any trouble, go down. Reboot both of your iPhone and computer and try again. Restore your device using Pangu restore function and try again. Enable Airplane mode and try again. Don’ t use your device while the process going on.